B&H # FMA.R.C. MFR # A.R.C. The A.R.C. Instrument Processor from FMR Audio provides a unique, niche function that allows a musician to change the balance of articulation, resonance, and clarity characteristics of an instrument. It can be used with a variety of acoustic instruments like mandolins, ukuleles, acoustic guitars, fiddles, violins, acoustic basses, lap steels, and more to unnaturally exaggerate certain aspects of the instrument's sound. The A.R.C. is generally operated in a range that sounds natural. Miking and performing on an instrument whose sustain levels are very low, the natural sound of the instrument can be restored using the A.R.C., especially in a live situation. This makes it easier to hear the instrument's true nature through the stage monitors. Additionally, the A.R.C. works as a dynamic processor, but is configured to achieve dynamic and equalization effects. When blended with the original instrument signal in varying amounts, it achieves the desired effect as a function of its front panel controls. A boost function that buffers and amplifies instrument signals to a higher level. A compressor that enhances your instrument's tone and dynamics. A direct box to interface your instrument to live or recording studio equipment. A studio effect that may be used to process audio tracks from your favorite Digital Audio Workstation (DAW) or recorder. INPUT LEVEL — This knob controls the gain of the input preamplifier. This control is used in combination with the DRIVE control to change how the A.R.C. will affect your instrument’s sound. This control will affect: the XLR output, the 1/4" output and the amount of input signal to the compressor. AMP LEVEL — The 1/4" output jack is intended to drive the input to an instrument amplifier. This control affects only this output and allows you to match the level coming out of the processing circuits in the A.R.C. with the level you get when the A.R.C. is bypassed. This control doesn’t affect the XLR’s output level. DRIVE — This knob sets the gain and mix levels of the internal compressor. When used in combination with the INPUT LEVEL control, this control will change how the A.R.C. will affect your instrument’s sound. This control will increase the aggressiveness of the compressor and the amount that the compressor’s output is blended with the unprocessed signal. BYPASS — When the GREEN light is on, the audio at the output connector is taken from the A.R.C.’s main signal path. 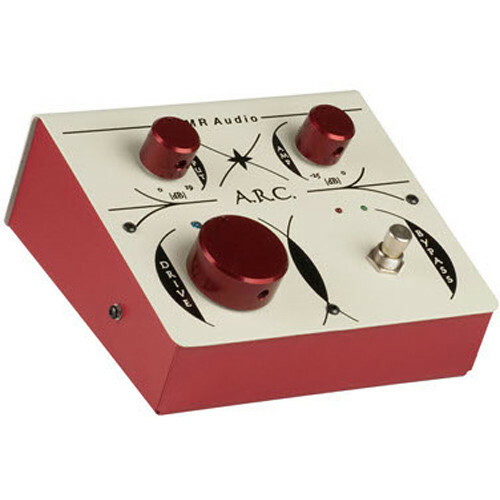 When the RED light is on, the A.R.C.’s internal circuits are not engaged and it’s as though you’ve plugged your instrument directly to whatever you’ve got connected to the output jack of the A.R.C., typically your amplifier. PROCESS LED — Simply put: the brighter this light, the more processing that’s being done by the compressor. Even though it’s not a multi-segment meter, with a little practice, this LED becomes a quick and useful indicator to help you judge how much the A.R.C. is processing your signal. Box Dimensions (LxWxH) 8.8 x 7.5 x 4.4"